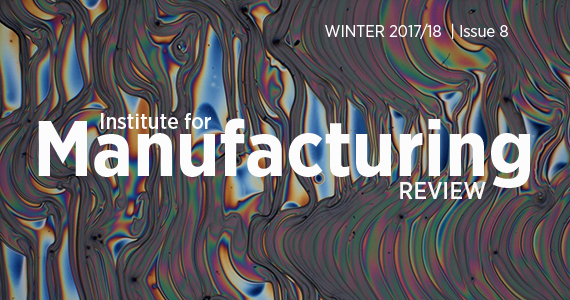 For this issue of the IfM Review we have borrowed the OECD’s concept of ‘The Next Production Revolution’ as a useful way of reflecting on some of our major research areas. Rapid advances in production technologies, particularly when allied with the digitalisation of manufacturing, promise a huge range of opportunities for national governments and individual firms – as well as the challenges that disruption inevitably brings. As manufacturing becomes more complex, distributed and interdependent, policy makers are looking for new ways to ensure national competitiveness in the ‘next production revolution’. Professor Bill O’Neill, Head of the Centre for Industrial Photonics, discusses the current role that precision industrial lasers and other technologies are playing in increasing capability and productivity. Where will we make things in the future and how will the concept of a factory evolve? IfM's Professor Duncan McFarlane says that how we answer these questions is affecting our priorities for automation. New digital technologies are supposed to bring us unprecedented efficiencies and new opportunities for value creation. So why has the productivity of major economies been slowing down? Additive manufacturing (AM) technologies have resulted in significant changes to the way we design complex components. But the uptake beyond prototyping and small scale production is slow. With new technologies appearing more rapidly than ever before, Dr Letizia Mortara says technology intelligence could help pick those that will deliver competitive advantage and spot the threats. Tom Ridgman explores the history of engineering education and how we should be educating the engineers of the future for the next production revolution. Newton Director Andrew Hawes shares some of the secrets behind his business and life successes, together with fond memories from his time studying at Cambridge.